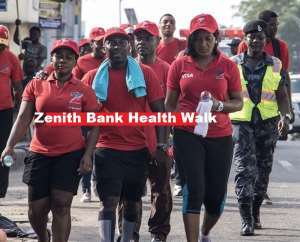 Zenith Bank on Saturday March 30, 2019, held its first health walk for year to create awareness on healthy living and the Bank’s digital products and services. The theme for the walk was, “Go Lite With Zenith Bank… Live Lite”. Henry Oroh, Managing Director and Chief Executive Officer (MD/CEO) of Zenith Bank (Ghana) Limited said the “ Go Lite with Zenith Bank” campaign which was launched in March was to encourage the use of the Bank’s digital products and services to make banking transactions faster and smarter. Some of the products and services highlighted by the MD/CEO were the Bank’s Point of sale Terminals, Zenith MasterCard and Visa Cards, Zenith Internet Banking, Z-mobile (the Bank’s mobile app), Scan To Pay, its USSD Code - *966#, Mobile Money Bank2Wallet Service and a host of others. He also told patrons of the walk to practice a healthy lifestyle and mentioned that the bank valued greatly the health of its staff, partners and customers, urging all to work towards living healthier lifestyles. The health walk attracted over 1000 participants. There was free medical screening, product sampling as well as lots of fun and entertainment. Mr. Oroh also commended customers for their loyalty and unflinching support in doing business with the bank over the years, adding that the bank believes in the innovative products and services they offer to their cherished customers. “We firmly believe that you, our cherished customers are the reason for our success and we want to assure you that we will always act in your best interest,” he added. “As we move forward, we must remember the things that have made us different and brought us where we are…Zenith people pursue excellence, deliver results, create value for customers, act with integrity and also are innovative,” he said. The Zenith Walk was supported by Printright, Kasapreko Company Limited, Latex Foam, Ashfoam, Promasidor, C and J Medicare, Eurapharma, Total House Clinic, St John Ambulance, Stallion Group of Companies, Permafix and the Ghana Olympics Committee (GOC).